Tampa, FL (August 22, 2017): David Weekley Homes hosted its third companywide CA+RE School Supplies Drive in 18 cities across the country. 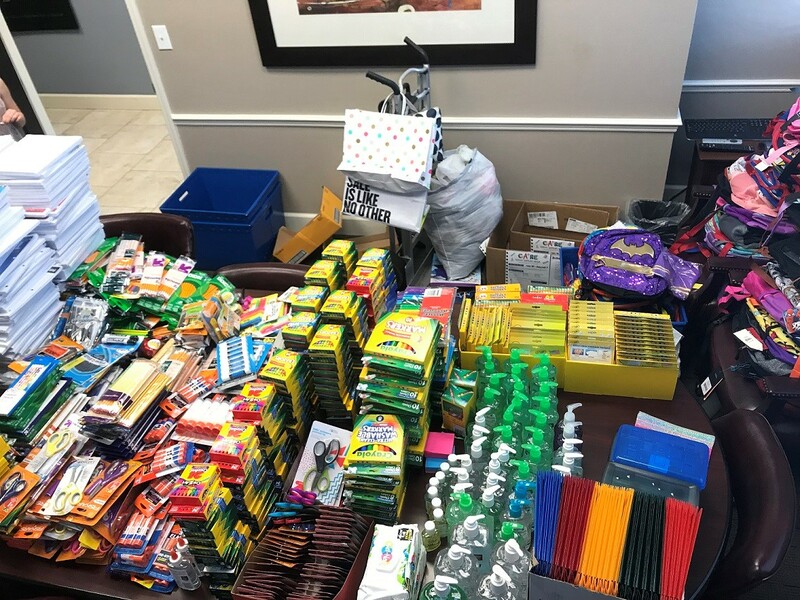 In Tampa, school supplies were collected for Chiaramonte and Potter Elementary Schools, Title 1 schools located in the Hillsborough County Public School system. “Thank you for all of the supplies that will help lead our students in the right direction,” said Melanie Hill, principal of Potter Elementary School. Approximately 70 backpacks full of supplies, as well as six additional boxes of supplies, for a value of $3,000 were collected from homeowners, homebuyers, vendors and team members during the drive, which benefitted approximately 200 children. After collecting the donations, team members invested 15 hours sorting the supplies and delivering them to the schools to ensure the supplies would be distributed in time for the students to begin school with the tools needed to be successful. The drive was an initiative of the company’s CARE program, which is a charitable and volunteer program that partners team members, homeowners, homebuyers and community partners with nonprofits to make a positive impact in the lives of everyone it touches and in all the communities it builds through its purpose, Building Dreams, Enhancing Lives. This is accomplished by company team members volunteering countless hours to different organizations in their communities and by The David Weekley Family Foundation donating more than $100 million to a variety of organizations through the U.S. and abroad over the past 20 years. David Weekley Team Members donated school supplies to Chiaramonte and Potter Elementary Schools.